A thorough exploration of the full circuit, stopping in nine locations around the park with an average of 6 hours trekking a day. Accommodation is mainly in refugios, with three nights camping and lodges in Puerto Natales on the days of arrival and departure. Our guide will meet you at the Punta Arenas airport and transfer you to Puerto Natales, a three-hour drive through the Patagonian pampa. They will take you to your lodging in Puerto Natales, where you will enjoy, dinner and have meeting to discuss the trip program. We start our trip with a transfer by van to Torres del Paine National Park. This two-hour journey through ranch country includes a stop in Cerro Castillo, the principal site of wool and meat exportation to Europe during the 1960s. 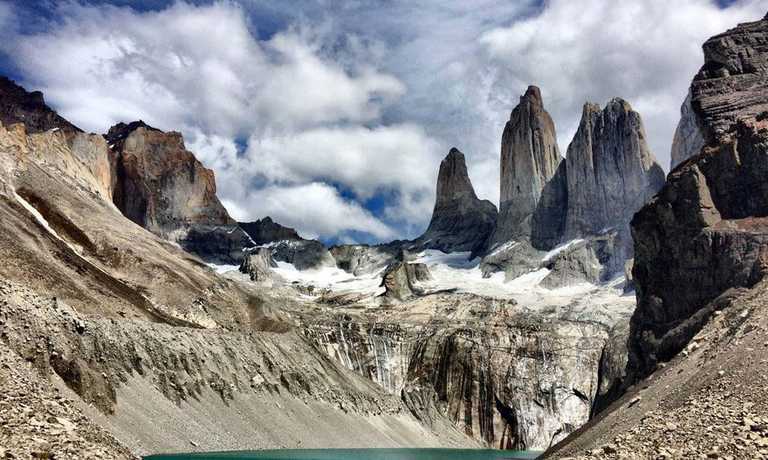 On arrival at Torres del Paine, we will trek to the base of The Towers. This is a spectacular hike to view the three pink granite towers that made the park famous. Today we start our trek around the Paine Massif. In the morning we will meet our porters, load up our gear and head out across ancient glacial moraines on the way to Camp Seron. The trail goes through Lenga forests where we often see Austral parakeets, several species of geese and the occasional guanaco and fox. 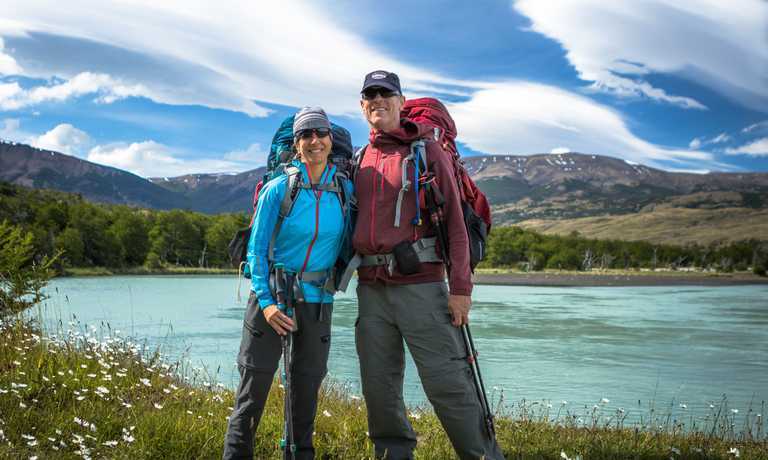 We will have an early breakfast before setting out for a hike to Lago Dickson, a glacial lake on the edge of the Southern Patagonia Ice Cap. We hike past bright blooming Notro bushes and make a stream crossing along the lake. This will be a beautiful and leisurely hike. When we arrive at Refugio Dickson, you can enjoy hot showers at the refugio and buy a cold beer! Length of hike: 6 hours. Today we don our packs and head out for a hike that is one of our personal favorites through pristine, old growth beech forest. We almost always see the incredible red-headed Magellanic woodpecker. 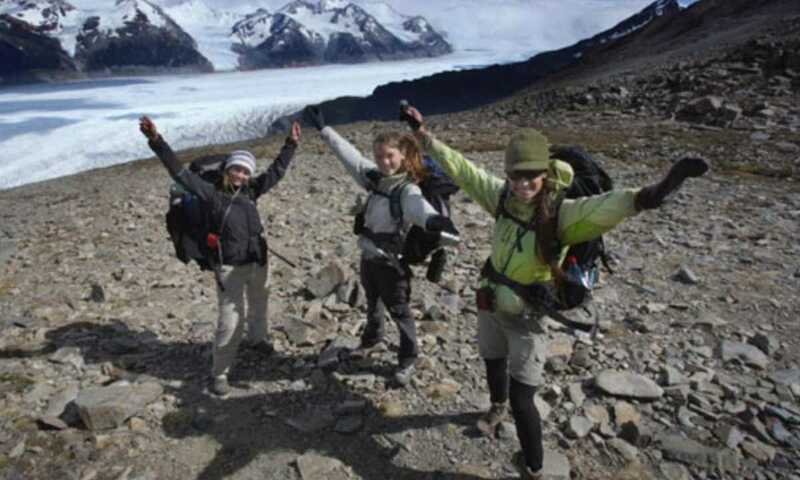 Just before we arrive at our camp, we will trek past Glacier Perros with fantastic close up views of the glacier and its lake. We spend the night camping at the base of Paso John Garner at Los Perros. Length of hike: 5 hours. Today is our biggest day of hiking as we climb over Paso John Garner and down through thick forest directly above the massive Glaciar Grey. Once on the pass we look out over rugged, glaciated peaks and the Southern Patagonia Ice Cap – a view not to be missed! The Grey Glacier stretches out below us like a huge white highway. Optional Kayak activity: From our base camp, located on the northeast coast of Lake Grey our guides will introduce us to the equipment needed for a kayak tour, and we will have a safety briefing. After this, we will carry the kayaks approximately 20 meters to the lakes’ edge. Now the tour really begins! We will be paddling around icebergs that are floating in the lake and afterwards we paddle towards the eastern side of the Grey Glacier to wonder at the spectacular scenery in this special place. If conditions permit, we can paddle closer to the glacier to get a really good view. After this, we will paddle back to the start point. During the afternoon we will cross a high plateau overlooking Lago Grey with its icebergs and the Grey Glacier on our way to Lago Pehoe, meaning "hidden lake" in the Tehuelche language. 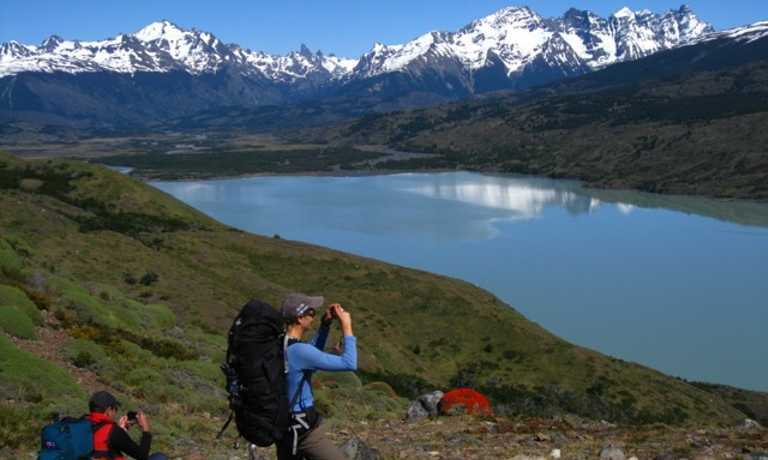 The rest of the afternoon will be free to relax at Lodge Paine Grande and explore the area. Enjoy a pisco sour in the bar that overlooks Paine Grande & Los Cuernos mountains in the beautiful evening light. Length of hike: 3-4 hours. Today we trek to the French Valley. This valley is the most beautiful in the park and one of the most unique in the world, surrounded by hanging glaciers and an amphitheater of granite walls and spires. After we trek out of the valley, we will continue to the extraordinary turquoise Lake Nordenskjold, where Refugio Cuernos is located. Length of hike: 8 hours. We trek along Lake Nordenskjold and below the hanging glaciers of Mount Almirante Nieto, to the reach Hosteria Las Torres where our van is waiting. We transfer to Puerto Natales and enjoy a farewell dinner. Length of hike: 5-6 hours. We will transfer you to Punta Arenas airport, and this marks the end of our services. This trip can run as a group trip, with prices starting from $2,695 per person for a complete group. If you are looking to join a group or you are a solo traveller we will help to form likeminded groups of travellers. Please let us know your travel plans.